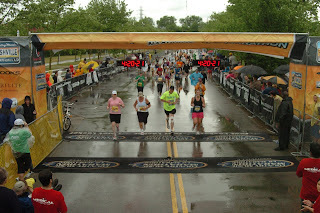 I finished two races last Saturday. We’ll, I actually finished one and watched the other being finished. My nephew Craig and I ran in the RunChikinRun 10K race in Murfreesboro. For you non-runners, 10K is about 6 and ½ miles. And for you people who think the race is named after my legs, it is sponsored by Chik-fil-let. There, we got that straight. It was a gorgeous day. About 1000 runners ran across the Greenway and through the Stones River Civil War Battlefield. I finished in the top ten in my age group (out of 12) and all in all we did pretty well, finishing just over 6 miles in about an hour. It was fun to run with Craig and we saw a lot of friends along the way. At the end Chera, my niece, and Josh, Jennifer and Jon-Mical were waiting for us, cheering us on. Really cool. The other race took a little longer. Vernette Cantrell died on Wednesday and was buried on Saturday. She was nearly 96. She started her race a long time before I ever thought about running. My guess is she passed through a lot of battlefields on her run and saw a lot of friends come and go along the way. She had been married to my father-in-law for 10 years, after both his wife and her husband had already finished their races. Vernette was an amazing woman. She gave her life to the church and counted doctors, college professors, and pastors in her family. Not to mention the fact that for 10 years she loved my father-in-law and our family and allowed us to love her. She and Pa, Doris’s dad, supported me and accepted me during my most stupid years, and cheered for my recovery over the last 8. Speaking of cheering, at her funeral on Saturday the church was full of people she had impacted, ministers she had helped, and the two families she had loved. We sang her favorite songs, told stories about her and laughed, wept together over scripture, took her to the cemetery then went into the fellowship hall and ate fried chicken and potato salad in her honor. It was quite a finish to a race well run. I haven’t finished that one yet but I am running it. And so are you. Someday, when we’ve crossed the last finish line some people will gather around what is left of us on this planet and sing our favorite songs, tell stories about us, weep over scripture, take us to a cemetery and throw dirt in our face. Then they will go back to the church and eat fried chicken and potato salad. And all that will matter at that point is how well we ran the race. Did we love God? Were we good to the people He gave to us? Did we open ourselves up to love and be loved? Were we honest about our faults and realistic about our failures? Most of the stuff we are worrying about today will not even be on the radar screen. As Paul said, “I have fought the good fight, finished the race, and kept the faith. Now there is waiting for me my reward, a crown of righteousness.” On Saturday Vernette crossed the finish line and I am very sure was handed a huge crown of righteousness by our Amazing Savior. Pretty good deal, huh?